The International Association of Exhibitions and Events™ (IAEE) is offering attendees the opportunity to give back to the community during Expo! Expo! IAEE’s Annual Meeting & Exhibition to be held 7-9 December 2010 in New Orleans, La. IAEE’s Gift of Service© benefiting Kingsley House will be held between 7:00 a.m. and 11:00 a.m. EST on Tuesday, 7 December. Expo! Expo! attendees will have the opportunity to give back to the New Orleans community and participate in one of several programs. 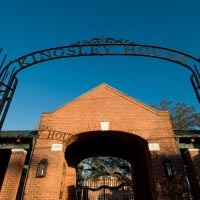 Kingsley House educates children, strengthens families, builds community support, and is dedicated to improving the quality of life in Southeast Louisiana by collaboratively working with others to build a comprehensive system of services and resources that meet the needs of the recovering community. Since 1896, Kingsley House has been helping the community’s most vulnerable children and families. From a settlement house for immigrants to a nationally accredited social service agency offering capacity building programs to more than 7,000 individuals, it continues to evolve and develop programs of service to the area. "When the community needed education on Tuberculosis in the early 1900s we were at the forefront, and when Hurricane Katrina devastated our city and our families, we created the Gulf Coast’s very first Resettlement and Recovery Center," says Kingsley House development director, Donna Paramore. "We are the community’s safe haven through times of dramatic change." Gives youth and teens a positive, safe place to go after school. In addition to the Gift of Service, IAEE and Global Experience Specialists® (GES) are once again hosting Humanity Rocks: A Celebration with a Cause on Wednesday, 8 December. Attendees will enjoy great live music and relax with colleagues while contributing to Payton’s Play it Forward Foundation. Established by New Orleans Saints Head Coach Sean Payton, the foundation’s mission is to improve the lives of families and children in the areas of health, education and social welfare in Louisiana, Mississippi, Alabama and Texas. "The need to help those less fortunate is always with us," says Karen Hegner, executive director of Payton’s Play it Forward Foundation. "In Louisiana and the Gulf Coast, those needs have risen with the destruction caused by Hurricane Katrina in 2005 and today with the Gulf oil spill. The needs and requests for help come in daily for services to help those affected with housing, bill payment, food and educational needs as well as emotional counseling. To date, Payton's Play It Forward Foundation has donated more than $500,000 to agencies that are working in the trenches helping families to overcome this devastation. "We have sent food trucks to the fishing communities to help over 3,200 families and are working to raise even more to continue this effort. We are partnering with Feed the Children and Protect our Coastline to ensure these families can remain in their homes and hopefully return to work soon. Along with that, we continue to raise funds and awareness of the needs still not met after Hurricane Katrina. Our goals in the future are to not only keep raising funds, but to also keep the spotlight on the areas in need and to give hope for a better tomorrow." USA Hosts are helping to facilitate and coordinate IAEE's Gift of Service as host city committee members. Other sponsors for Humanity Rocks: A Celebration with a Cause include founding sponsor GES®, entertainment sponsor Austin Convention and Visitors Bureau, transportation sponsor Production Transport, Inc., gold sponsor PRG and supporting sponsor Convention Data Services. For complete details about Expo! Expo! IAEE’s Annual Meeting & Exhibition 2010, visit www.iaee.com/expo.